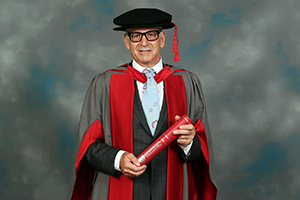 Daniel Miller, founder of leading record label Mute, has been awarded an honorary degree by Middlesex University. Mute boasts a long history of number one chart successes - in the UK and around the world - and works with some of the biggest names in the music business. Started by Mr Miller in 1978, the company has grown into an international business with an artist roster that includes Goldfrapp and Erasure. Other famous names who've signed with the label in the past include Depeche Mode and Moby. Mr Miller originally recruited Depeche Mode to his fledgling label with just a handshake agreement - and went on to help them achieve worldwide chart success, co-producing the first five Depeche Mode albums. When Depeche Mode's original songwriter Vince Clarke left to form the synth-pop duo Yazoo in 1981, Miller suddenly found himself with two highly successful pop acts. In more recent years, he was instrumental in achieving huge popularity for Moby's 1999 album 'Play'. From initial modest success, the album turned into a 10 million-selling phenomenon. Since then the label has continued to build on Mute's long history of commercial and critical success. Mr Miller, who grew up in Golders Green, said: "It makes me quite proud that Middlesex University would think of me for this award - I was really delighted when I was first approached. "It was great to be able to put on the cap and gown, and to meet the students." Middlesex University Vice-Chancellor Professor Michael Driscoll said: "Daniel Miller has been hugely influential in popular music culture for over 30 years. "He is a real inspiration for anyone wanting to work in a creative industry, and we are so pleased to be able to present him with this award."